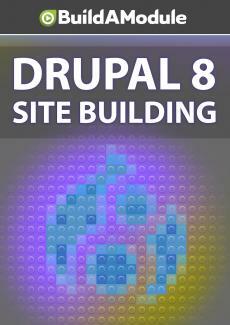 Solutions for chapter 14 of "Drupal 8 Site Building"
Enjoy suspense? Then don't watch this! And here are the answers to the quiz questions, Question One, "The Security Review module will make your site secure," true or false, and the answer is, False. It can help you make the site more secure yourself, but it doesn't actually change your site in any way. Question Two, "If you use HTML in the source "for a textarea that is not allowed in the text format, "what happens," and the answer is, C.
"The non-allowed HTML, will be permanently removed "the next time the content is edited and saved, "but only if there is a Wysiwyg enabled. " The non-allowed HTML does get removed from the content when it's displayed, but not permanently. The content stays the same in the database as when it was saved, it will only be permanently removed if it's edited out in the edit form, and that can happen if you have a Wysiwyg enabled that's stripping out non-allowed HTML. Question 3, "Images uploaded through IMCE "are unmanaged files," true or false. And the answer is, True, because of this it's important to be aware that when you delete an image through IMCE that you could be affecting other places where that image is being used. Question Four, "Which text formats are usable "by authenticated users by default?" And the answer is, B and C, Basic HTML and Restricted HTML. Plain text is allowed for authenticated users, but it will only be usable if both Basic HTML and Restricted HTML are removed from their role. And Question Five, "To see CSS styles rendered "in the Wysiwyg, what do you need to do?" And the answer is, C, "Add a setting to a custom theme. " It would be nice if there was some other way, but as of this recording, there's not. All right, let's take a look at the solutions to our challenges. So the first challenge was to, "Subscribe to "security announcements on Drupal. org.